Figure 3.3. 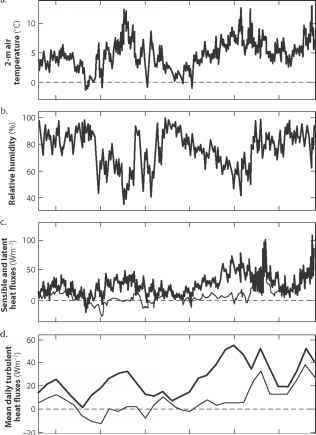 Two-meter meteorological fields and surface energy balance fluxes on Kwadacha Glacier, July 15 to August 15, 2008. All fields are based on 30-minute automatic weather station data. (a) Air temperature. (b) Relative humidity. (c, d) Sensible heat flux (heavy black lines) and latent heat flux (thin gray lines), with (d) giving the mean daily fluxes. (e) Net shortwave radiation. (f) Incoming (thin line) and outgoing (heavy line) longwave radiation. (g) Mean daily radiation fluxes. Incoming and outgoing longwave radiation (solid and dotted gray lines), incoming and reflected shortwave radiation (solid and dotted black lines), and net radiation flux (heavy gray dashed line). (h) Mean daily net energy flux. from a melting snow surface to melting glacier ice, associated with an albedo reduction from 0.63 over the late-July snow surface to 0.22 over the ice (table 3.1). The observed melt at the site was 924 mm w.e. for the period July 15 to August 15, approximately half of the total summer melt. Table 3.1 summarizes the mean energy fluxes during this period and for the full summer melt season. Net shortwave radiation drives the summer melt, accounting for an average daily energy supply of 105.4 W m-2 to the snow/ice surface from July 15 to August 15 (figure 3.3e, 3.3g). This increases dramatically when the ice is exposed and surface albedo drops. As a result, ice melt during the final 10 days is roughly equal to the snow melt from the preceding 21-day period, despite lower levels of incoming solar radiation. Longwave radiation acts as a net heat sink of -20 W m-2 during the 1-month period. Outgoing longwave emissions are relatively uniform from the melting surface (figure 3.3f, 3.3g), following Eq. (3.10). Incoming longwave flux falls to values below 250 W m-2 on clear nights, when humidity drops (figure 3.3b). The net radiation during the 1-month period is 85.3 W m-2, 72% of the net energy, QN. For the full summer, net radiation makes up 78% of QN. Outside of the tropics, this is typical of the surface energy balance over snow and ice during the melt season, with 60% to 90% of available melt energy derived from shortwave radiation. Note: All fluxes are averages for the period, measured in W m 2, with symbols as defined in text. Modeled melt, mmod, is based on Qn and Eq. (3.2a), whereas observed melt, mobs, is based on measured snow densities and an ultrasonic depth gauge. energy to the glacier in this example, 26 and 7 W m-2. These values are sensitive to the assumptions about surface roughness. For z0 = 0.1 mm, the average fluxes decrease to 17 and 5 W m-2, and z0 = 10 mm gives 48 and 13 W m-2. There is a persistently stable stratification in the near-surface boundary layer over snow and ice, so stability corrections typically reduce the magnitude of the turbulent fluxes. Such corrections may be warranted in this case in order to reduce the modeled melt in table 3.1 to match the observed melt. As this is just an example here, there has been no effort to tune the energy balance model. Sensible heat flux is correlated with net radiation at Kwadacha Glacier, as air temperatures increase over the bare glacier ice in August. Shortwave and sensible heat fluxes act in concert to double the available melt energy in this period. Across the time period of figure 3.3, sensible heat flux was positive 98% of the time while latent heat was positive 76% of the time (figure 3.3e). This was a period of warm temperatures and moist air masses, with condensation prevailing over sublimation. For the full summer, sensible and latent heat fluxes were positive 90% and 52% of the time, with periods of sublimation giving a slightly negative mean latent heat flux (-1 W m-2). 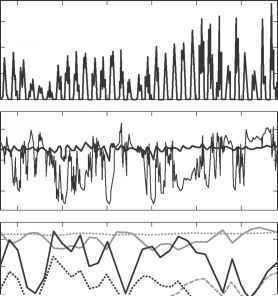 The energy fluxes in this example are from a specific example of a midlatitude mountain glacier, but they are representative of the energy fluxes that drive summer melting of seasonal snow, sea ice, river and lake ice, and the permafrost active layer. The terms in the energy balance look markedly different in the late autumn and winter, when seasonal snow and ice spread over the high-l atitude oceans and continents. At this time, incoming shortwave radiation is low, with the sun winking out at polar latitudes (QS* = 0). Longwave radiation continues to provide a net loss of energy, and the net energy, Qn, is negative. The atmosphere, land, and surface waters cool, precipitation falls as snow, and on those parts of the planet that dip below 0°C, rivers, lakes, and ocean waters begin to freeze up. 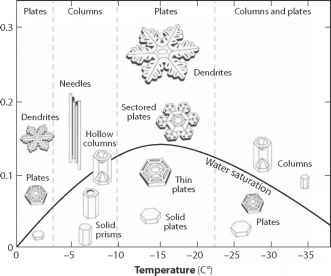 The next several chapters discuss the main features of these different elements of the cryosphere.